Futurpiano showcases three influential avant-garde composers associated with Futurism, by way of piano music composed between 1913 and 1933. Arthur-Vincent Lourié was the first Russian Futurist musician and a signatory of the original St Petersburg Manifesto in 1914. The five Synthèses written that same year offer a form of dodecaphony, while Formes en l'air from 1915 is a Cubo-Futurist conception using an innovative form of notation, dedicated to Pablo Picasso. Born in the Ukraine, but raised in New York, Leo Ornstein gave his first major recital of 'Futurist Music' at the Steinway Hall in London on 27 March 1914. The programme included the two bold pieces featured on this album, Suicide in an Airplane and Three Moods. American-born 'Bad Boy of Music' George Antheil is represented by Mechanisms (1923), along with a series of preludes written in 1933 and inspired by a graphic novel by Surrealist artist Max Ernst, La Femme 100 Têtes. 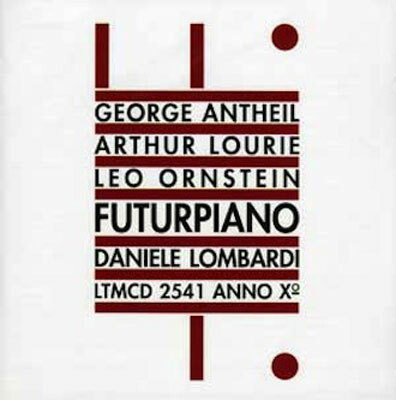 All selections on Futurpiano are performed by noted Italian pianist Daniele Lombardi and were recorded in Rome and Lugano in 1995.